Of all the legends that have been selected to the Baseball Hall of Fame, Tom Seaver was elected with the highest percentage of votes. His nearly unanimous election exemplifies how universally respected he was as a pitcher and why he earned the nickname "The Franchise." Seaver's baseball cards are equally as respected and this top 10 list brings together his best cards appearances during this playing days and beyond. Shop for Professionally Graded Tom Seaver Cards on eBay. 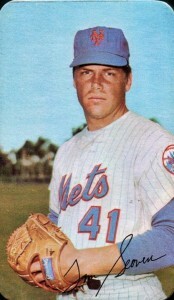 Seaver started his career with a bang by becoming National League Rookie of the Year in 1967. He, along with teammate Nolan Ryan, would become the faces of the New York Mets in the late 1960s and early 1970s, leading the Miracle Mets team to the World Series in 1969. A 3-time Cy Young Award winner, Seaver would finish his career with 311 wins and more than 3,600 strikeouts. 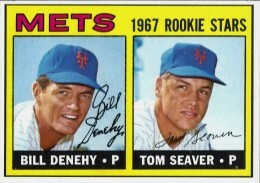 Tom Seaver's Topps rookie card is one of the most valuable from the 1960s but he has some affordable alternatives from the same time period that are more budget friendly. Switching gears, check out the 1969 Topps Stamps set or 1969 Topps Decals to find some mini options for Seaver. His expertise on the mound led him to be featured on many pitching leaders cards in several Topps sets and collectors can look for his 1971 Topps N.L. Strikeout Leaders card with appearance by Bob Gibson and Fergie Jenkins. Another great card that should be included in any collection, but didn't quite make the top list, is his 1976 Topps Record Breaker card honoring eight straight 200+ strikeout seasons. Seaver was traded to the Cincinnati Reds in 1977 and collectors can check out 1978 and 1983 Topps for his top cards from that era. 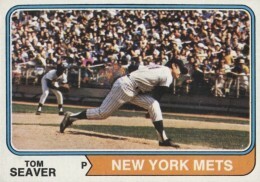 A notable error card featuring Tom Seaver, or technically "not" featuring Seaver, can be found in 1985 Donruss in which a picture of pitcher Floyd Bannister was used on Seaver's card from the set. Donruss eventually corrected the error, resulting in there being two versions of card #424. Completists will enjoy tracking down the 1992 Pacific Trading Cards set devoted exclusively to Tom Seaver and covers his entire career. If you are a high-end collector, there are some amazing combo autograph cards with Nolan Ryan in 2005 Topps Co-Signers and with Dwight Gooden in 2015 Topps. Because he pitched for two decades, a wide variety of collectors with different budgets can collect Tom Seaver cards. While no cards from the 1980s made the top ten, accessibility related to card value was a major focus utilized in constructing this list, along with factors like design and the overall significance of the given card. I'm a little personally biased towards Seaver's 1977 Topps card as it was one of the first singles I ever purchased at a card shop as a kid. Along with this great-looking base card, Seaver also has a Strikeout Leaders card that he shares with his former teammate Nolan Ryan. In addition to his base card in the 1970 Topps set, collectors can find this card honoring his win in Game 1 of the N.L. Championship Series. 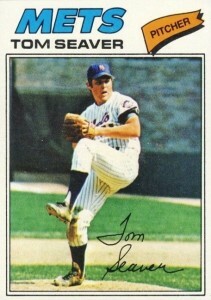 Seaver also won Game 4 of the World Series, earning his nickname "Tom Terrific." The "Super" part of these sets from Topps relates to their over-sized dimensions and possibly the higher-quality paper and high-gloss photography. The cards in the 1971 Super set have rounded corners and there are no short-prints, making it a fairly easy set to complete for that time period. A fairly common inclusion in Topps sets from the 1970s that you don't usually see today are pitchers wearing windbreakers or jackets while pitching. 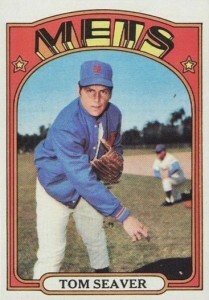 Seaver wears one on his 1972 Topps card with a teammate stretching in the background. He also has an In Action card from the 1972 set that has him reacting to a bad call or maybe a great play, it is really up to the viewer's perspective. 1975 Topps has another image of Tom Seaver wearing his windbreaker, but this time under his jersey. Along with this colorful base card, there is also a mini version of this card that was only offered in test markets in Michigan and on the West Coast. One of the most beautiful action shots for the pitcher, the 1974 Topps base card features Seaver in the process of throwing heat. Mets first baseman John Milner is shown behind Seaver, ready for the ball, with plenty of fans watching the play unfold. 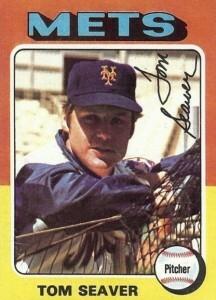 While Tom Seaver has signed in several high-end sets, it not be accurate to call him a frequent signer. Many of his recent inclusions, like in 2011 and 2015 Topps, were sticker signatures, making on-card Seaver autographs a premium option. 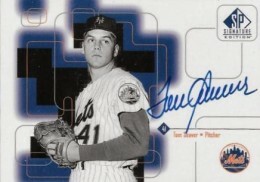 A nice example of an on-card Seaver autograph featuring him as a Met can be found in 1999 Upper Deck SP Signature Edition. Several Donruss products from 2005, including Donruss Classics, feature autographed cards with Seaver in a Reds uniform. 1968 Topps awards Seaver an All-Star Rookie Cup, which would go nicely with his 1967 Rookie of the Year Award. His 16-13 record may not seem that amazing, but was actually quite impressive considering the Mets lost 101 games that year. An interesting collecting project might be to collect all the All-Star Rookie Cup appearances on Topps cards through the years. Seaver's card would certainly be one of the most expensive of that collection. The design of 1968 Bazooka was a drastic change from previous sets as the cards were placed on the side of the gum packages rather than on the backs. This resulted in tall, narrow cards that were certainly an anomaly in in the hobby during the 1960s. 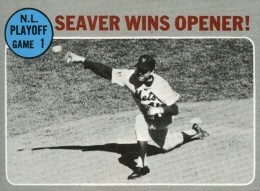 Seaver was included on boxes along with Tiger's slugger Al Kaline. 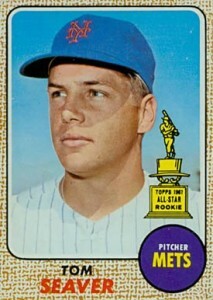 The Tom Seaver rookie card is often considered the most valuable card from the entire 1967 Topps set. He shares the card with Bill Denehy who pitched in parts of three seasons and is best known for being on Seaver's rookie. It's interesting to note that Seaver was originally drafted by the Dodgers in 1965 but never signed with the team. He would have been a part of an amazing pitching staff with three Hall of Fame members. Nolan Ryan Tom Seaver Signed Autographed 1974 Topps Card. HOF. SGC.